Plenty of things to talk about from today’s Nindie’s Spring Showcase, Kotal Kahn will be a playable character in Mortal Kombat 11, three Quantic Dream titles coming to the Epic Games Store, and Konami is releasing three anniversary collections with games from their long history. Nintendo packed a lot into today’s Nindie’s showcase coming at just under 30 minutes. There are a few “yeah that makes sense” games announced and a few surprises. Let’s get into it! First up is a game that really needs no introduction. Cuphead is coming to the Nintendo Switch on April 18th. Making this a reality is the friendship that Microsoft and Nintendo have right now, even the video acknowledges that Microsoft helped make this happen. Cuphead is an excellent title and should sell well for the Switch. Overland is launching later this year and it will be coming to the Switch as well. The mix between strategy and survival is quite intriguing and the randomly generated levels could make this a surprise hit later this fall. Under the category of “this screams Devolver Digital” is My Friend Pedro, an action title with a big emphasis on using those moves that looked so cool in the Matrix. The main player can jump and twist as they gun their way through enemies towards their objective while being guided by a banana named Pedro. Yes, seriously. My Friend Pedro is coming to the Switch as a console exclusive this June. Cab rides can be interesting if you get the right person and you will meet many in Neo Cab. Set in a future where a mega corporation called Capra runs the fictional city, you're the last human cab driver in a time where things are pretty much automated. Choosing who to pickup, what to say, and how to manage your finances will be key to survival along with trying to reunite with your lost friend who is wanted by the mega corporation. 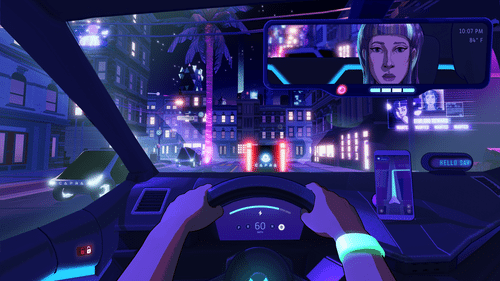 Neo Cab launches this Summer. The Red Lantern was a total surprise, who expected a story driven experience involving dog sledding? An emotional trailer sets the stage as an unnamed female character who wants to turn things around by moving to Alaska and race in the famous Iditarod race. The game features roguelike elements and some survival aspects such as taking care of your dogs and hunting for food. The Red Lantern looks impressive so keep an eye out for it when it launches later this year. The forest can be a dangerous place, especially at night. Darkwood channels this fear with survival horror by tasking players with gathering resources during the day and staying away from the horrors at night, preferably in their hideout. Levels and enemies are procedurally generated so no playthrough will be the same. Darkwood launches this May. Slicing and dicing through your enemies will be key in Katana Zero. As a master assassin, your goal is to leave no one left to tell about your exploits. The action looks stylish and you’ll even be able to slow down time to deflect bullets. That little tool will be needed as our stylish assassin goes down in one hit. Story wise there seems to be a more than meets the eye. Katana Zero launches on April 18th. An apocalypse is bad but two apocalypses? That is even worse. Such is the premise of Rad, a 3D action rogue-like title coming from Double Fine and published by Bandai Namco. On the quest to find the solution to essentially restore the world and humanity, the lead character will be exposed to different mutations that are tough to look at but give great benefits to gameplay. It has the style and charm we have come to expect from Double Fine and this one could be…rad. We’ll have to find out when the game launches later this summer. Creature in the Well is giving us something we really haven’t seen before, an action-pinball game. More or less that is what is going on as the protagonist fights in various dungeons hitting energy orbs towards bumpers and other objects that you would expect to find on a pinball table. The premise is pretty sound and the action looks like it could get very intense in the later levels. Creature in the Well will launch later this summer. Betrayal can never be forgiven in Bloodroots, a top-down action title coming to the Switch. As the anti-hero Mr. Wolf you’ll use pretty much anything you can find in your environment to take out your foes while stringing together combos. Bloodroots launches later this summer. A world with moose, alligators, and foxes walking and attacking each other? 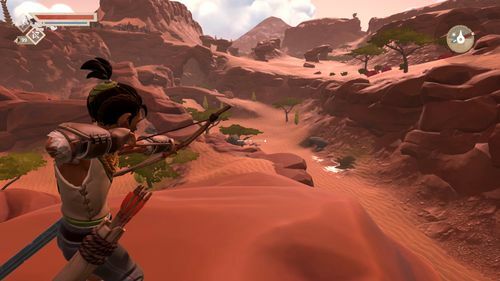 Surely, Pine is going for something a little different in this open-world title. Our hero will need to scavenge for items, barter, harvest, craft items, and sell to the market to get by. Traversing six biomes and encountering five different factions, this certainly plays to the open world genre. Pine will release this August. Super Crate Box is coming to the Switch in April and with it comes multiplayer, exclusive to the platform. Nuclear Throne makes a surprise appearance on the Switch starting today and is available in the Switch eShop. The Vlambeer Arcade will launch on the Switch later this year that will house several bite-sized games over time. The first one to be available is Ultra Bugs where enemies will constantly be shooting and respawning once you’ve taken them out. Full of action and intensity, it’s perfect for the arcade experience. Hope you’re not afraid of the deep water. Swimsanity! is a shooter that takes place under the sea with up to four players as you take on the creatures of the depth. Over 150 challenges await along with several game modes that feature co-operative and versus modes. Swimsanity! paddles to the Switch later this summer. Adding another to the “and it is out today!” category is Blaster Master Zero 2. An early hit for the Switch, the sequel is upping the ante with new abilities for Gaia-Sophia battle tank and Jason to take on new foes throughout the galaxy. Gaia-Sophia can absorb SP anytime it falls from great heights or takes damage during battle and Jason can counter enemy attacks. With the player now able to travel to various planets through the galaxy, the exploration element could really be turned up. Blaster Master Zero 2 is available now on the Nintendo eShop. When you’re not binging on the show, Stranger Things 3: The Game might keep you occupied. Launching on the same day as the new season, July 4th, you’ll take control of 12 characters in events that follow the new episodes. The game can be played either solo or with a friend in local co-op. Just before getting to the last game, a sale for current indie titles was announced. Games such as Firewatch, Blossom Tales, and Night in the Woods are on sale at the eShop. For the final title announced, it really was something unexpected. We see gameplay that resembles Crypt of the Necrodancer but then a familiar tune starts to play as it becomes clear, this game is set in the Legend of Zelda Universe. Cadence of Hyrule is essentially Crypt of the Necrodancer plus The Legend of Zelda, it actually kinda states that in the full title. Princess Zelda and Link are here to lend a hand as well. Grind to the beat when Cadence of Hyrule: Crypt of the Necrodancer featuring The Legend of Zelda launches this Spring. Nintendo really seems to be getting things in order for their Switch lineup this year and the indie titles shown today are no exception. Of importance is that several of these titles are coming to the PC and other platforms as well. It is not secret that the Epic Games Store is snatching up games for their store. A video presented today revealed more games coming to their platform including three Quantic Dream titles that had only been available previously on the PS3 and PS4. Heavy Rain, Beyond Two Souls and Detroit: Become Human are coming soon to the Epic Games Store. Below is a list of other titles also coming to the Epic Games Store. And who is this trailer supposed to be about? Having already been revealed in the story trailer for Mortal Kombat 11 a few weeks ago, Kotal Kahn is now confirmed as a playable character. Usually the reveal trailers showcase the character in the title but this is pretty much Jacqui Briggs’ showcase as much as Kotal’s. Judging by the fatality at the end, the developers are not short on creative ideas. Konami has drawn the ire of fans in the last few years with the handling of the few games they have released along with how they essentially showed Hideo Kojima the door in unceremonious fashion. But there was a period when the company was putting out games frequently and of great quality as well. This leads us to the company celebrating its 50th anniversary with three different collections featuring some of their hit titles. First up is the Arcade Classics that includes eight titles from their arcade history. For only $19.99 (digital only), the games and price seem to be appropriate. While some omissions include licensed titles such as TMNT and X-Men, the reason behind their exclusion would likely be license issues. Below is the list of games included in the Arcade Classics Anniversary Collection. Up next is a series that should be familar to Konami fans. The Castlevania Anniversary Collection will feature eight games although only four have been announced so far. Below is the list of the four games announced and the platform from which the games were featured on. Lastly is a series that many run and gun titles have to thank. The Contra Anniversary Collection will also house eight titles with four only being revealed so far. Check out the games announced for the collection below. All three anniversary collections are coming to the PS4, Xbox One, Nintendo Switch, and PC. The Arcade Classics collection will launch first this Spring with the Castlevania and Contra collections releasing this summer.